The lovely team at Penguin Random House sent their bloggers a few books of their choice over the holidays. 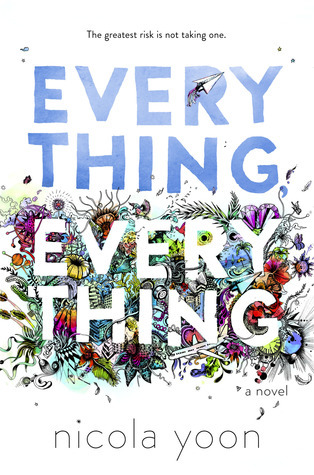 Everything Everything by Nicola Yoon was one of my picks. There were a couple reasons why I just had to have it. First, I had heard so many great things about the book in the fall and I didn't want to pass up the chance to read it. Second, that cover! It was designed by the author's husband and the image above doesn't do it justice. I realized after I read the book that the cover has more meaning and becomes even more beautiful once it all clicks. Now... on to the details! As an infant, Madeline was diagnosed with SCID, severe combined immunodeficiency. Put simply, it means she is allergic to EVERYTHING. Madeline has lived in a sterile environment for as long as she can remember. She only has physical contact with two people. Her mother who is also her physician and her nurse Carla. Madeline's days are fairly structured - home schooling via Skype, occasional games/movie nights with her mom and frequent vital checks throughout the day. She is content with this life. Mostly because she doesn't know any different, that is, until the new neighbours move in. Madeline watches Olly and his family from her window. After a few awkward interactions through their bedroom windows, the two eventually become friends. It is through this friendship that Madeline's eyes are open. Suddenly her life in a bubble are no longer enough and she wants nothing more than to break free. This book has Everything: characters you can relate to, IM conversations, one liner book reviews on classical literature and even little sketches to help elaborate on some of Madeline's thoughts. She is a wonderful and refreshing character. Her light-heartedness and fairly positive outlook is not something you would expect given her health condition and upbringing. Her relationship with Olly, though predictable at times, is so heart warming and innocent that you can't help but cheer them on.The book flows so well that you don't even notice how much time has passed since you picked it up. Everything Everything will play jump rope with your heart strings and leaving you hanging for more. A recommended read, especially with Valentine's Day just around the corner. Disclaimer: I received a finished copy of Everything Everything from Penguin Random House of Canada. All opinions are my own. I have this one on my TBR list for this year. Not my normal read but I look forward to it.